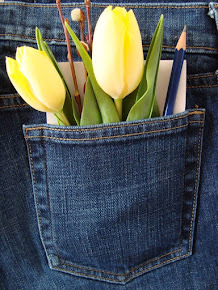 Pocketfuls: Creativity... with a crunch! Today I thought I'd add in some imaginative fun with food, too. I made some toast, spread it with nut butter, and let the boys go wild piling it high with healthy "toppings" from little bowls in the centre of the kitchen table. It's a craft... it's lunch... it's toast pizza! I did this little project with them once before and it was a huge hit, despite the fact that it was ridiculously simple. Funny how sometimes you don't even have to try very hard to win your children's admiration! Provide your children with their own plate of toast each (with a side of fresh raw veggies) and watch them build (and then devour!) their masterpieces. Noah and Will said this was definitely "the best lunch ever!". I hope your kids think so too!